A decade after winning The X Factor, pop sensation Alexandra Burke today announced that she will be embarking on her The Truth Is UK tour this autumn. 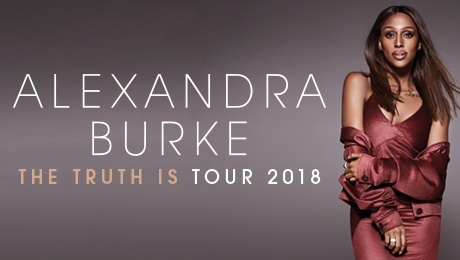 Her first UK headline tour since 2010, The Truth Is will see Alexandra take her infamous soulful to Theatre Royal, Glasgow on Wednesday 12 September 2018. Tickets are on sale to ATG Theatre Card holders now and go on general sale on Friday 26 January. Alexandra will perform songs from her eagerly-anticipated new album, The Truth Is which is released by Decca on 9 March. The new album is Alexandra’s third studio record and features a host of original tracks showcasing her phenomenal voice and songwriting talent. Fans at the touring shows will enjoy these new songs, as well the No.1 smash hits including Hallelujah, Bad Boys and many more. 2018 year marks 10 years since Alexandra won the fifth series of The X Factor, performing alongside Beyoncé in one of the most unforgettable moments in British TV history. Alexandra’s winner’s single, a cover of the late Leonard Cohen’s ‘Hallelujah’, holds the current European record for single sales over a period of 24 hours, selling 105,000 copies in just one day. The song also became the top-selling single of 2008 in the UK and the landed the coveted UK Christmas No.1 spot. By January 2009, the single had sold over one million copies in the UK alone – a first for a British female soloist. Her first album Overcome debuted at No.1 in the UK Album Charts, with four No.1 singles on the UK Singles Chart and the Irish Singles Chart – Hallelujah, Bad Boys, selling over 780,000 in the UK and becoming a Platinum selling single, All Night Long and Start Without You. One of the most successful alums of that year, Overcome earned her three BRIT Award nominations as well as thousands of loyal fans across the world. In 2014, Alexandra made her West End debut starring as Rachel Marron in the highly acclaimed musical, The Bodyguard. In 2016, she took the lead role of Deloris van Cartier in the musical Sister Act, which toured the UK and received 5 star reviews across the country. Alexandra is currently performing with her Strictly dance partner Gorka Marquez on the Strictly Come Dancing Live UK Arena tour, which runs until 11 February.